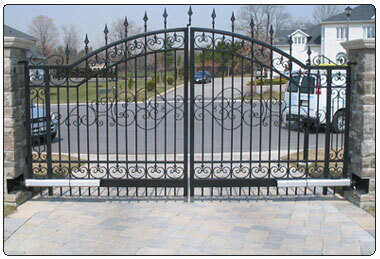 Gate Openers Direct carries a large selection of dual swing gate operators. A dual swing gate opener combines two operators to open two gates in a swing method. Often these gate operators are set up in a Master/Slave grouping. If your looking to open two gates from a hinge then dual swing gate openers are for you. As an authorized distributor of swing gate operators (swing gate openers / swing gate motors) our products carry an authentic factory warranty. If you have any sales or technical support questions give us a call at 877-688-GATE or contact us by e-mail. The Viking G-5 Dual linear arm swing gate opener has a compact, highly-efficient and a low-profile d.. This new and improved swing gate opener by Vikings is one of a kind because it can solar power to op.. The manufacturer has discontinued this item; the replacement item is their new FAAC S800HThe FA..